The Wayne State University Mike Ilitch School of Business has announced the 2017 recipient of its signature Executive of the Year Award. La June Montgomery Tabron, president and CEO of the W.K. Kellogg Foundation (WKKF), will be honored at the school’s 37th Annual Recognition and Awards Program on Thursday, Aug. 24, at the Detroit Marriott at the Renaissance Center. As a champion for vulnerable children and for creating the conditions necessary for all children to thrive, Tabron leads the Kellogg Foundation and its work to ensure all children, families and communities – regardless of race or income – have opportunities to reach their full potential. Under her direction, the foundation seeks to improve the education, health and well-being and economic security of children and families – and embeds in this work a commitment to racial equity, to developing leaders and to engaging communities in solving their own problems. Prior to becoming the first female and first African American president and CEO to lead the foundation in its 87-year history, she served in a variety of positions at WKKF after joining the organization as controller in 1987. Most recently, she was the executive vice president of operations and treasurer, which included oversight of all financial plans, policies and relationships within the financial community, as well as WKKF’s technology, human resources and administration, finance, program services, and quality and organizational effectiveness functions. She also provided leadership for WKKF’s place-based grantmaking in Mississippi and New Orleans, launching a significant effort to help set young males of color on the path to success in 2013. Tabron has played an active leadership role in the Kellogg Foundation’s racial equity, diversity and inclusion work– both internally through work with its board and staff, and externally through its work with grantees, partners and vendors. Under her leadership, WKKF organized the first-ever National Day of Racial Healing on January 17, 2017. In June, she received Crain’s Change Maker Award from as a dynamic and influential leader for her commitment to promoting racial equity. Throughout her three decades in philanthropy, Tabron has participated in numerous sector efforts, including the policy and annual conference committees for the Council on Foundations and the board development and transparency committees for Independent Sector. 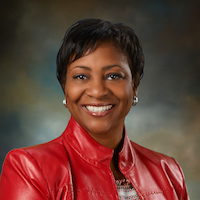 As a community and civic leader, Tabron serves on Detroit Workforce Development Board, the Alumni Association of the University of Michigan Board and is a member of the Kalamazoo Chapter of the Links, Inc. She also serves on the boards of Battle Creek Community Health Partners, Bronson Healthcare Group and the Kellogg Company. Tabron is also the chair of the W.K. Kellogg Foundation Trust. Prior to joining WKKF, Tabron was an auditor for Plante Moran. She holds a bachelor’s degree in business administration from the University of Michigan and a master’s degree in business administration from the Kellogg Graduate School of Management at Northwestern University. She received honorary doctorates from Union Institute and University, Ithaca College and Marygrove College in Detroit. In 2016, she was named to the Crain’s Detroit Business 100 Most Influential Women list. And, in 2017, she was named to Black Enterprise Magazine’s list of 100 Most Powerful Women in Business. She is a certified public accountant and certified management accountant licensed in Michigan. She is also a graduate of the inaugural class of the Council on Foundations’ Career Pathways Program. For the second year in a row, the Annual Recognition and Awards Program will be emceed by Fox 2 Detroit anchor and reporter Roop Raj. In addition to Tabron, the event will also honor student scholarship recipients, Distinguished Alumni Award winner David Leone, Emerging Leader Award winner Fares Ksebati, and the yet-to-be-announced winner of the Inspirational Teacher Award.